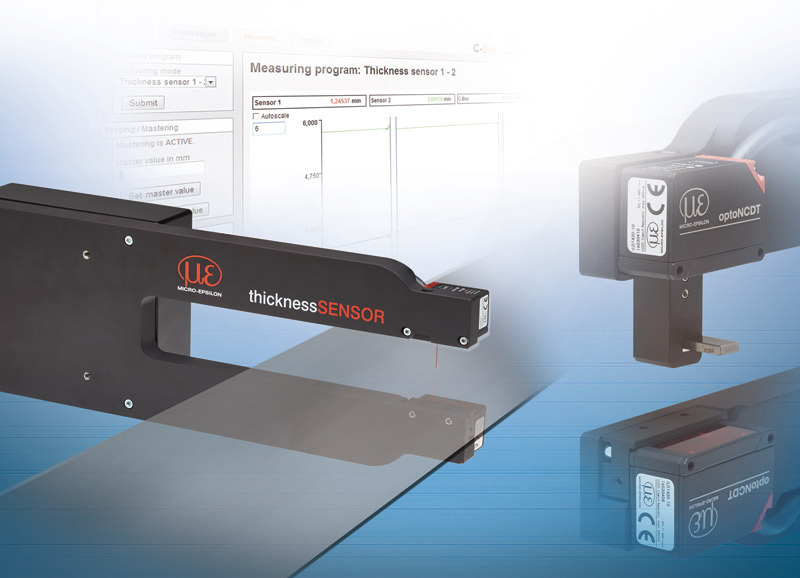 The thicknessSENSOR is particularly well suited to precision measurement of narrow strips. This compact sensor system from Micro-Epsilon extends the C-frame product range for thickness measurement. The sensor provides extremely high precision results combined with ease of use and a compact design. The measurement process is performed on a non-contact, wear-free basis. The system consists of two laser triangulation sensors that are fixed opposite to each other on a frame and measure against the target from both sides. The evaluation unit integrated in the frame calculates the thickness values and outputs them analogically via tension and current or digitally via Ethernet. The sensors can be easily aligned for the respective measurement tasks. Due to its extremely compact size, the system can also easily be integrated into restricted installation space. The thicknessSENSOR reliably measures strip and plate material such as metals and plastics without making contact. The system stands out due to its cost efficiency and can be used as a data source for documentation purposes and monitoring tasks, enabling high-performance in production. The intuitive web interface provides the new sensor system with particular ease of use and enables the user to load individual presets for the respective measurement task. Up to eight user-specific sensor settings can be stored and exported in the setup management feature. The measurement task can be optimized using signal peak selection and freely adjustable signal averaging.